With over twenty years in global business, I understand the challenge of global business and finding just the right partner to help executives excel in their roles. In my most recent role as the CEO of Luminosity Global Consulting Group, I was responsible for the continual growth of a thriving business, while still having the privilege of doing something I loved to do – executive coaching. I have seen, and experienced, first hand, how executive coaching is the single most effective way to move senior leaders from good to great. As a result, I have dedicated my life to making a difference in others careers… and their lives. Executives benefit from having a strategic thinking partner with relevant business experience, as well as the support of an independent sounding board to help them fulfill their potential. As an experienced executive coach, I am dedicated to enabling my clients to create and sustain peak performance, deal with the pressures of being a senior executive, provide ongoing support and an objective viewpoint, as well as honest feedback that will allow them to reach unprecedented heights in their careers. What I have observed, first and foremost, throughout my years in global business is that leaders, unless coached, never reach their maximum potential. I am committed to making that happen for each and every one of my clients. Thanks for stopping by and also for considering me as someone who can help you, or your executives, achieve more than you ever thought possible. I am honored and look forward to speaking with you soon. This page provides an overview of what I have to offer, along with information that I hope will be of value to you. Click on the links below to take you directly to the relevant sections. Being a Top Executive or Senior Manager is very demanding in these highly competitive times where there is often more focus on the bottom line than ever before! You Are There For Everyone Else, But Who Is There To Support You? The most successful companies employ Executive Coaches to support top Executives and Senior Managers. Ensure you develop a “Blueprint ” to take you from where you are now – to where you want to go. To ensure you are never limited by the boundaries of past thinking – you must develop the capacity to think backward from your imagination, rather than forward from your past. You need to want to make a change. If you aren’t ready to commit your time, resources and sustained effort do NOT hire a coach – it is a big commitment that only pays off if you are fully invested. No amount of time or money can make the process work if you are not fully committed. You’re willing to invest and understand the potential for a significant ROI. Know that hiring an executive coach requires time, money and effort on your part. However, at the same time, also understand that once you put into practice what you are taught, you can easily generate many times the return on your investment. You’re ready to get your hands dirty. Realize that coaching will only work if you’re willing to put in the work to get the results. Coaching is action based – it’s not like a therapy or counseling session where you just come in and talk. If you’re ready to roll up your sleeves and to get to work, then consider a professional executive coach. You’re ready to set excuses aside. Don’t show up and put excuses on the table. We have heard them all and will not let you get away with lame reasons and justifications for not capitalizing on your investment. You will need to be accountable and remember that making excuses is only a waste of your own time and money. You plan to stay the course. If you think executive coaching is a quick fix solution with the answers to all your problems, it’s not. Identify what you want to achieve and understand that sustainable development and change are long term prospects – usually a minimum of six months to a year to generate sustainable change and productive results. You’re prepared to take risks. It might not be easy to practice and implement what you are taught if it requires you to step out of your comfort zone. Be willing to take risks and feel uncomfortable. If you do what you’ve always done, you’ll always get the same results – remember the definition of insanity? If you’re not ready to take a risk, and make significant changes, you are not ready for executive coaching. I have been a leader in global organizations for more than 25 years, working for some of the most prominent global companies in the world. I have spent my career in global business, most recently as the President and CEO of Luminosity Global Consulting Group, a privately held strategic leadership coaching and consulting firm providing a full range of services focused on developing exceptional executives across boundaries & borders. I devote my time to leading, writing, executive coaching, and speaking. My blog, Leadership Across Boundaries &amp Borders is followed throughout the world, with hundreds of thousands of visitors every month. In addition, I also have more than 35,000 followers on Twitter and 2,500 LinkedIn followers. The Cultural Integration Practical Application: A step by step model to ensure that leaders are internalizing the importance of cross-cultural communications, while at the same time integrating critical tools and techniques to work successfully across boundaries & borders, often with multiple cultures simultaneously. 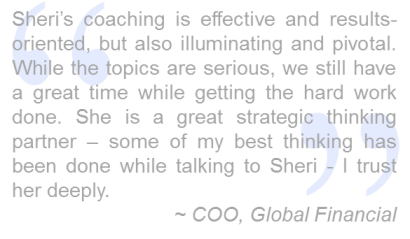 Extreme Global Leader: A year long intensive coaching program design to ensure that global leaders not only survive, but thrive, in their complex environments. On a personal note, I have been happily married to my husband, Steve, for over twenty-nine years. We have two amazing children, Stephen and Savannah, as well as two rambunctious Shih-Tzu’s – Barni and Zoey. We live outside of Los Angeles, California. In my free time, I enjoy reading, exercising, and traveling throughout the world. I have been immersed in global business for more than 25 years and have written several books on critical aspects of leadership – specifically relevant to global executives. Throughout the years I have been extremely successful leading global operations for some of the top global companies in the world. My experience, along with my extensive coaching experience, make me uniquely qualified to coach executives with global responsibility. 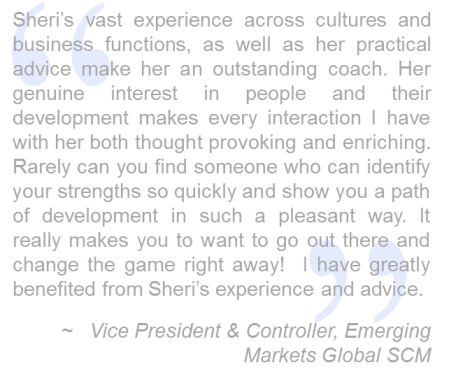 In my Executive Coaching practice, I provide an integrative approach to Behavioral and Cross-cultural Coaching to facilitate extraordinary results across global organizations. I employ a proprietary behavioral psychology framework because I know and understand from experience the importance of targeting measurable behaviors in driving targeted, measurable results. A wide variety of behavioral techniques and methods are used to assist clients in achieving mutually identified goals to significantly improve performance and, as a result, to improve the effectiveness of the organization overall. I combine a behavioral framework with an intercultural orientation in order to assist executives within global organizations successfully achieve their goals across borders and boundaries. I have developed a proprietary approach that allows the deployment of a fully integrative approach that ensures a multi-faceted approach to cross-cultural communications. I am focused on helping global executives to facilitate successful multicultural relationships that will enhance and optimize business operations, as well as the individual and executive teams ability to be effective across all cultures. 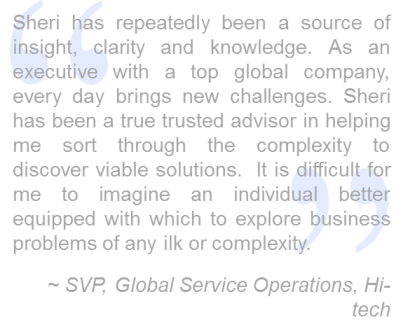 As a result, my clients drive exceptional business and interpersonal results across the global organization. I analyze organizational and business leader needs and develop solutions to create the organizational practices, processes and systems that will help the organization thrive in global environments. The majority of businesses today are global, markets are local, and business leaders must learn new ways to think and act globally and locally simultaneously to effectively deal with today’s rapid pace of change. Leaders have to learn to successfully confront and overcome new and intimidating levels of chaos and uncertainty in global business environments. My proprietary EGL coaching methodology assists executives in multicultural organizations to maximize their managerial and leadership skills in a safe, neutral and objective environment. This enables executives to step away from their day-to-day routine (for a short amount of time) to discuss the challenges and opportunities they face in their unique environment and facilitate effective organizational practices and solutions on a global scale. One-on-one sessions providing individual support or customizable programs designed to encompass the global context of the executive role. Often the issues facing top leaders reach across boundaries & borders. They involve the leadership team, the board of directors, or the overall business strategy and context. In those cases, we will not only coach the leader, but also consult with the leadership team, coach individual executives, and facilitate action that enables the global system. For the broadest reaching issues, I conduct custom interactive learning and strategy programs for groups of leaders. Highly rated program topics include rapidly garnering strong support for initiatives, having more impact on the organization, setting up succession planning, creating an overarching vision or strategy for the organization and more. Through retreats, strategic meetings, and experiential activities, you’ll move your business forward and work through sticky team or business dilemmas while still taking the full landscape into consideration. Simply knowing that cultures differ is no longer enough in today’s global marketplace. To be successful in today’s business environment, leaders at all levels of an organization need to know how cultures can differ and what they can do to be successful in communicating across cultures. I design workshops using my proprietary CIPA model specifically to provide an integrative model for successful cross-cultural communications. Workshops are interactive, allowing participants to practice newly acquired knowledge and skills in a safe environment. Both our individualized and team coaching, as well as training workshops are particularly beneficial for leaders directly managing cross-cultural teams or project groups, professionals who regularly travel to other countries on business, international team members or those with a superior or subordinates from disparate cultures. Remote and virtual team management has become the norm for many organizations, yet it is not usually done well. Virtual teams and virtual organizations are how things get done across boundaries and borders. What many organizations do not recognize is that building and managing virtual teams requires different skill sets. When leading or working with remote teams, it is critical to have the ability to overcome barriers of distance, cultural differences and time variances, while maintaining communications leveraging multiple levels of technology. In virtual teams, a leader may or may not have line control or full time access to team members, adding still more complexity to the environment. Virtual Team Coaching blends practical tools with tips, techniques, exercises and ideas to help virtual team leaders, as well as team members, to initiate, maintain and develop effective remote and virtual teams. I provide critical remote management skills to ensure leaders excel in today’s global business environment. This flexible coaching option can be adapted for virtual team leaders, members, and project organizations. Step One: Completely read all the information provided – specifically around expectations and rules of engagement. Step Two: Complete and submit the Coaching Interest Form. Due to time constraints, I will not be able to take phone call inquiries without this first step being completed. Step Three: Within twenty four hours, I will respond and provide you with more information. Step Four: Once your form is on record, I will contact you to schedule an initial 30 minute consultation for you within two weeks. Thank you, once again, for your interest.